Berkeley Classic Combo PRO White Base with 30x42" Cherrywood Top with Shelf Unit. Berkeley Classic PRO combines key accessory of slidable shelf and support to our most popular model. White Base with 30x42" Cherrywood top with White Shelf. 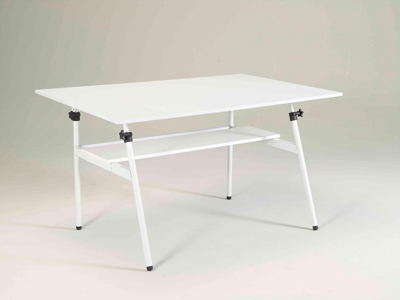 Includes an easy U channel grove bracket for securing over side-support brackets that must be lifted off unit to allow legs to be folded inward and top to fold down for storage . Shelf attaches to bracket for support and can be slid along table side-support brackets to vary location of shelf unit. Shelf: 12"x32". Assembly required.